Today you will discover the best 10 Veggies to Spiralize If You’re Trying to Lose Weight. Now is the perfect time to spiralize your way to the body you’ve always wanted. With a spiralizer, you can spin literally everything from zucchinis to sweet potatoes and create vegetables noodles in a variety of thicknesses for a satisfying meal. Simply put, a spiralizer is a must-have kitchen gadget for the health conscious. You’re probably wondering how these “spiralizing gadgets” work and most importantly, what types of vegetables are best to spiralize – Read on; because in this article, we will discuss the best veggies to spiralize and how to get the best spiralizing results. First, make sure you choose the right zucchini (when you squeeze the zucchini, it should be firm). Zucchini is a healthy, low carb, low fat alternative to pasta that is quick and very easy to make – It’s also packed with lots of fiber and we all know that taking a lot of daily fiber helps one feel satisfied on fewer calories – this is definitely Rebel Wilson’s weight loss secret; she makes sure she gets in at least 35 grams of fiber to reduce daily calorie intake. 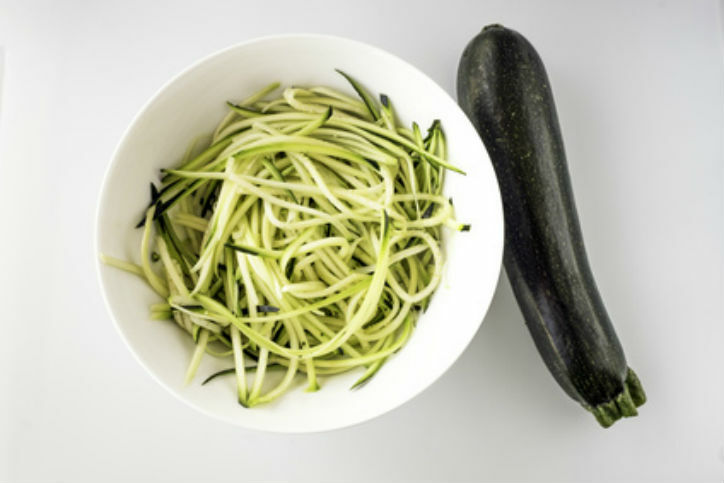 After spiralizing your zucchini; you can either boil your zucchini noodles for 20 seconds or sauté them by placing a pan over heat, adding some olive oil, and tossing in your zucchini noodles once the pan is hot. This is a versatile vegetable harvested mostly in the summer months – like zucchinis; this will help you stay full while curbing cravings. Use your spiralizer to create long twirls of pasta-like yellow squash noodles – sauté a medium sliced onion, garlic powder, ground ginger and toss in your noodles as soon as they come out of the spiralizer. Keep in mind that you can use both zucchini and yellow squash for a colorful bowl of vegetable noodles. To spiralize butternut squash; first trim the top, peel the skin off, and cut in 2 pieces – now spiralize using the thickest noodle setting of your spiralizer. Try pre-heating oven to 200 degrees C, toss your squash noodles with olive oil (and garlic), then roast for 30 minutes. With 95% water and 40 calories per cup of cook, cucumbers are the perfect low-calorie snack and also a great way to prevent dehydration & overheating. Toss your cucumber noodles with a cup of sliced onion – add salt and pepper to taste. Why carrots? – They are sweet and starchy, low in calories and carbs. To add texture to your salad; you can make raw and delicious-looking carrot noodles with your spiralizer slicing blade. You can also sauté carrot noodles over medium-high heat for 5 to 10 minutes with teaspoons of whipped butter and a dash of cinnamon –additionally, season with salt and pepper. Do you know that the fiber found in this vegetable provides digestive support and helps prevent cancer? – Broccoli is an edible green plant with lots of health benefits. To spiralize your broccoli, use the long stalks and carefully turn these stalks into noodles – sauté your broccoli with your favorite red sauce. For gorgeous potato noodles, choose the right sweet potatoes (Good potato is usually firm with less flaws on its skin). Remember to peel the potato before spiralizing – this is very important because the skin of the potato can make the spiralizing process a bit tougher. After spiralizing, make sure you use a large ‘non-stick’ pan and plenty of oil to cook your noodles. You can sauté your sweet potato noodles, roast in the oven, or even turn the noodles into rice. If your goal is to eat clean and healthily – start eating your spiralized beet noodles raw or cooked. Before eating raw; you can whisk up cider vinegar, garlic, and a little olive oil over the noodles. Add salt and pepper to your own tastes. One cup of this vegetable has 28 calories and 2 grams of fiber – in fact, studies show that fiber from red cabbage relieves symptoms of gastrointestinal conditions and prevents constipation. Red cabbage is bursting with antioxidants – therefore; mix your cabbage noodles, apple cider vinegar, and onions for a satisfying veggie noodle. Yes, you can spiralize an apple. All you have to do is remove the stem, attach the apple to the end of your spiralizer, and turn the crank. After spiralizing, you can either sauté in pan for a 5 minutes, roast in an oven for 10 minutes, or simply serve raw.